These rocky roads are a vegan version of the classic rocky roads which normally contain butter and milk chocolate. 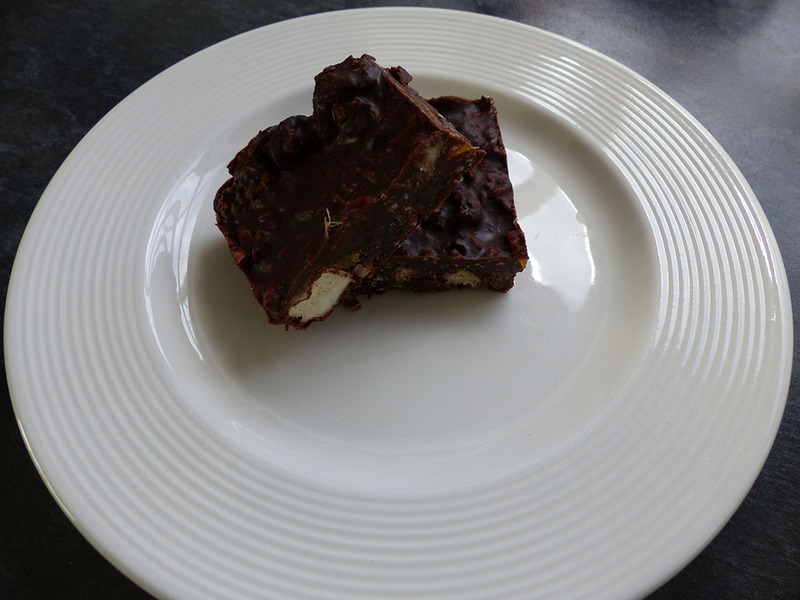 By using coconut oil and vegan milk chocolate you can still have a tasty vegan rocky roads treat! Melt the chocolate, syrup and coconut oil in a heavy based sauce pan over a low heat. Mix the rest of the ingredients together in a big bowl. Add the melted chocolate mix and stir until everything is coated in chocolate. Put the mixture in a baking tray lined with baking paper and press lightly to create an even surface. Leave to harden for at least 2 hours in the fridge. Enjoy with your picnic, days out to the zoo, as a tasty snack or as a vegan dessert.